Justly recognized for engineering and manufacturing industrial air systems that are Built for a Lifetime™, Kaeser Compressors is a highly respected brand name in the industry. In addition to its highly visible involvement with CAGI, the Compressed Air Challenge® and other initiatives, Kaeser has produced a wealth of white papers, user guides and other information materials that educate and inform plant operators on how to gain the most from their compressed air systems. 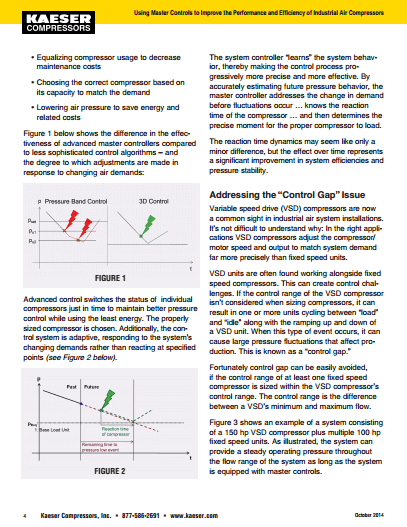 One such example is a white paper we sourced, wrote and produced that covers the use of master controls to improve the performance of industrial air compressors – including reporting on the latest technological advancements that are delivering significantly improved operational efficiencies.